Hi Touch Of Belle readers! My name is Mimi from Love and Life in Nicosia (http://loveandlifein.blogspot.co.uk/) I'm a London girl living on a Mediterranean Island, I have four legged friend, love food and am on a constant pursuit to find budget beauty items. Gone are the days when I could pop into Boots or Superdrug and pick up all my essentials for less than £20. This might have been one of the hardest adjustments when I became an expat; where do I buy my beauty items? And that's not the only problem; the change in climate affected my beauty regime, but after three years I think I have adjusted. 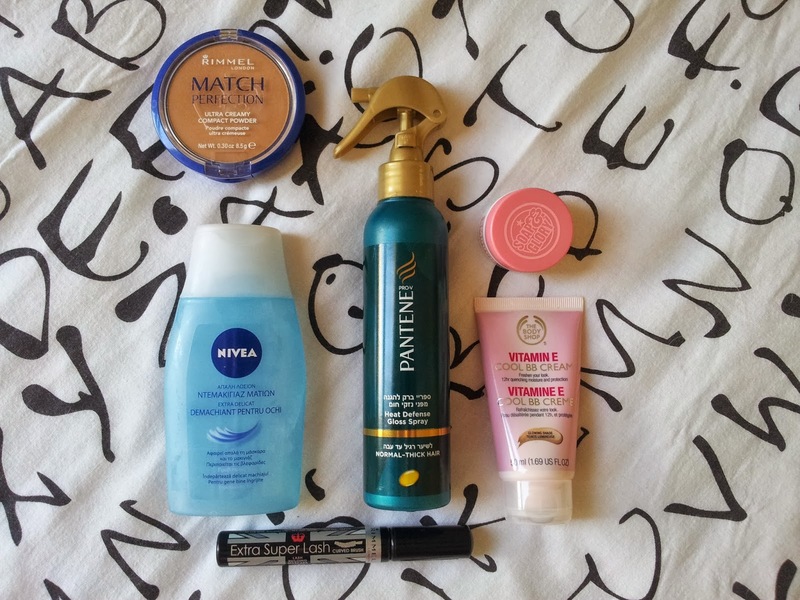 So this is a round-up of my favourite budget and expat-friendly beauty items. anti clockwise from top left: Rimmel Match Perfect Compact, Nivea Daily Essentials Make-up Remover, Rimmel Extra Super Lash Mascara, Body Shop Vitamin E Cool BB Cream, Soap and Glory Smooch Operator Lip Balm, Pantene Pro V Heat Defence Gloss Spray. Powder is an essential item when the humidity levels pick up; The Rimmel Match Perfect Compact is a great little product for eliminating shine and providing coverage, yet feels light on skin, which are all really important factors in a hot climate. Some days there isn't much make up left on my face by 7pm, but a good cleanser/make-up remover is a must. I have noticed a real change in my skin since moving to Cyprus; the heat adds to the natural oily state of my skin, my pores get clogged more from sweat, make-up and SPF care, yet the air conditioning dries out my face, so cleansing is super important and this Nivea product is hands down my favourite; its gentle, has fresh smell and leaves my face feeling really clean. I try to keep my make up really simple in the summer; eyeliner/eyeshadow feels heavy on my face in the heat and I prefer to stick to mascara only, so a good one is really important for me. The Rimmel Extra Super Lash gives me the same effect as the Benefit Badgal mascara but at a fraction of the cost. And then there is the issue of base; the Body Shop Vitamin E Cool BB Cream is my base of choice; its light, it covers well and it adapts to the changing tone of my skin as summer gets going and my tan comes out. I have noticed my lips suffer as much during summer in Cyprus as they did in winter in London. The Soap and Glory Smooch Operator has a great smell, rich texture and works wonders on my chapped lips. The last product I count among my essentials is the Pantene Pro V Heat Defence Spray; I plaster it on my hair before I go to the beach as well as before blowdrying/straigthening my hair. I have naturally thick and somewhat frizzy hair and this spray really helps to keep it smooth, healthy and protected from the heat I inflict upon it. Thanks for having me today. I blog about all sorts from beauty, expat life, fashion and food, so come on over and say hello.